Although still relatively new in the Sinn Collection, the Sinn 104 I has become one of the best selling watches in the company's history, and the fine link bracelets adds a nice touch to the classic design of this watch. Verified Owner Comments: Initial impressions of this piece of German engineering are fantastic. The 104 is very similar to Sinn's EZM3F (Flieger), but with a beautifully polished case and bracelet, sapphire exhibition back, increased water resistance, full day/date, and without some of the EZM's more technical details. The 104 has an unpretentious yet very noticeable and classy wrist presence. Online photos or videos don't do it justice. I recommend it for both the entry-level or advanced buyer. Purchase with confidence with Watchbuys' efficient client service. 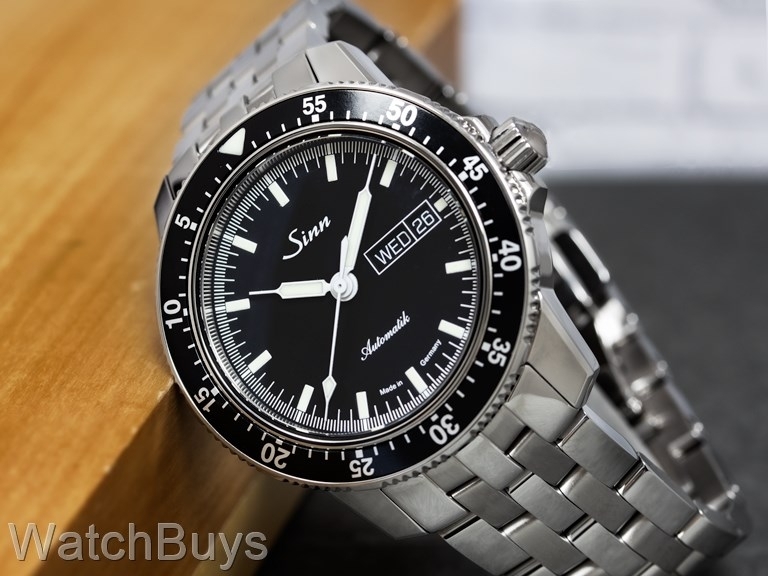 Verified Owner Comments: This was my first Sinn purchase and I had done a lot of research on which version I wanted and where to buy it from. I was a little hesitant to buy online without ever trying on a model of this watch but I have to say that the buying experience with WatchBuys was excellent and the watch looks absolutely amazing in person. For the price I think you are getting excellent quality and WatchBuys delivered it on time and in perfect condition, they even set the watch to my timezone before sending it, which was a nice touch. I will definitely be using WatchBuys in the future. By the way the fine link bracelet is great quality and very comfortable. Verified Owner Comments: Love the look of this watch. Only drawback, albeit not a dealbreaker, is the crown action is very rough. When unscrewing the crown, it immediately comes out to the first position (the position used to change the day/date). I inadvertently changed the day the first couple of times I unscrewed the crown. Verified Owner Comments: The experience of buying my first timepiece from Watchbuys was painless. Customer service was professional and tentative. I would most definitely buy another watch from them. Verified Owner Comments: Love the watch and much more satisfy with customer service. They contact you right away to make sure you happy with the purchase and no questions un-answered for your watch picked. Verified Owner Comments: I've had this watch for a month and it is great! The quality is amazing. Verified Owner Comments: I am really enjoying this watch. It keeps excellent time and is-really nice looking on the wrist. The time from the order to delivery was great. Watch Buys called to confirm the shipping details and the watch was delivered on time and as promised. The entire purchase experience was great. An excellent watch and a fantastic purchase and customer service experience. 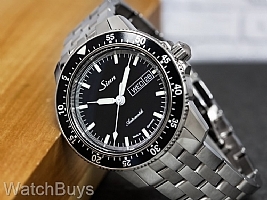 Verified Owner Comments: I really like this Sinn 104 on a bracelet. So incredibly functional, clear, simply yet elegantly designed, with all the information I need. Great contrast between the hands and the very black dial. The fit and finish are first class. Love the fact that it has day and date!